My mom made the best German Potato Salad. 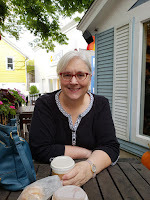 She got the recipe below from a friend when we lived in Harbor Beach, Michigan. I hope you enjoy it as much as I do. Cook 12 potatoes with jackets on. When cool, peel and slice. Chop 1 onion and fry with six slices of cut up bacon. Blend dry ingredients and make paste by adding vinegar. Add this to the boiling water and oleo/bacon grease. Cook until smooth. Combine potatoes and gravy. Heat only until potatoes are warm. Sprinkle top with parsley and paprika. My memory of my mother's bacon grease container. My thoughts: Who remembers having a jar of bacon grease in the refrigerator? I do. 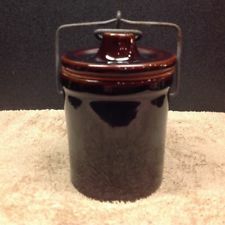 My mother had one, it was a brown ceramic crock with a metal snap lid. It was recycled and it originally came with cheese spread. I had a bacon grease container when we were first married, but I kept mine in a jar. I rarely cook bacon now, and do not keep the grease. For this recipe you would use the grease from the fried bacon. Oleo is oleo-margarine or margarine as we know it today. I think using bacon grease adds to the flavor of the dish. You may think 2T. is a lot of salt and it is, but remember you have 12 potatoes and they need salt. I remember my mom making German potato salad at New Year's Eve and in the fall. I was lucky enough to be able to take leftover German potato salad back to college with me my sophomore year, after Christmas break. I think it was gone the first night I got back to college, it was that good. The cheese that came in the jar was awesome too!!! I make German potato salad at work. It is very different, maybe the Austrian influence. I will be trying yours for sure. Where in the World is Eleanor Begole Poor?